The 3DR Radio telemetry system is designed as an open source Xbee replacement radio set, offering a lower price, longer range and superior performance to Xbee radios.The SiK firmware includes a bootloader that permits radio firmware upgrades over the serial interface, and radio firmware with configurable parameters. Air Radio Module is used for UAV or equipment or aerial work equipment. Ground Radio Module is used to connect to a computer or display images on other equipment in the ground. When two modules are bound with the wireless signal, we can use the APM ground station(Mission Planner) to adjust and upgrade the parameters. 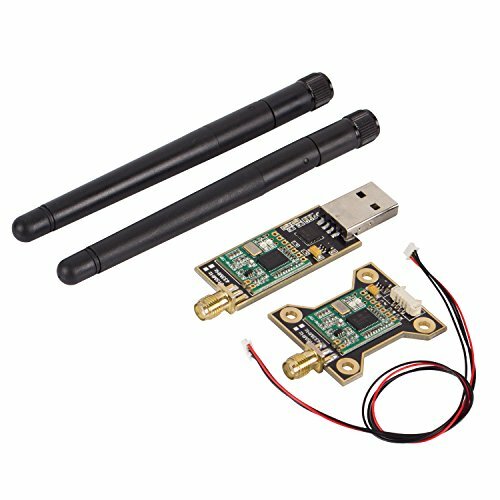 The 3DR Radio telemetry system is designed as an open source Xbee replacement radio set. 915Mhz frequency band. Receiver sensitivity to -117dBm. Support OTG of Android Cellphones,and computer OTG. Smaller and lighter, it can be placed in the sleeving and also be tied to the mechanical arm. Transmit power up to 20dBm (100mW). Transparent serial link. Antenna connectors: RP-SMA connector. Firmware upgrades and configuration are fully supported in the APM Mission Planner. Configuration is also possible through AT commands.